We live and play in Maine! We know what hunting, fishing, and trapping are all about. 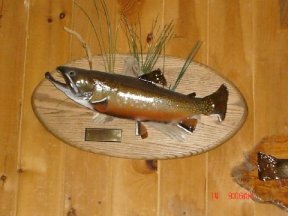 We work with taxidermy firms all over the Northeast and beyond to provide consistently high quality trophy identification plaques for your prize catch. If you have a 'standard' for your trophy presentation, we can probably match it - with quick turnaround and quality service at very competitive prices. No minimum orders either. We can also work with you to find a brass or other plaque that will properly identify but not draw attention away from trophy objects if you want something different. We can drill mounting holes to your specifications and we'll provide the mounting screws as well. If you want a 'backer', we can cut to your specifications so that your trophies will have a clean, consistent and professional look. 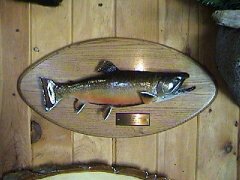 If your prize trophy fish, bird, head or whatever isn't identified properly, its value is diminished. Why not get a nice brass plate for it? We don't charge 'by the letter' so you can put date, location, weight, time, and other essential information on it. Shiny gold brass, black brass, or our plastic material with a great brass appearance: it's a lot less expensive than you might imagine. Send us a fax with the information you'd like and we'll help you properly identify that trophy that you're so proud of! 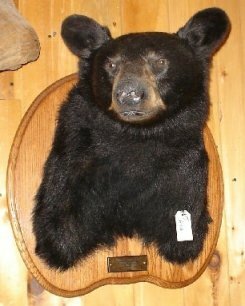 Our thanks to Northland Taxidermy for these photos.